Craigslist is a bored car-guy's best friend and his wallet's worst enemy. It was the end of the summer and I had just finished up work and was laying on the couch. My birthday was quickly approaching and I was browsing the internet looking for more used car parts or wheels to purchase for my Subaru. 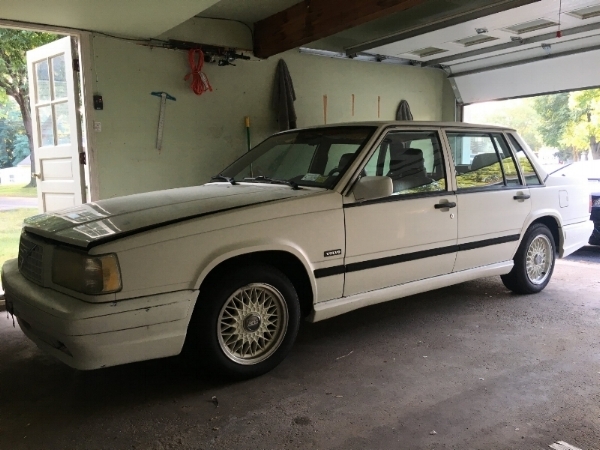 Amongst the spam posts and small thumbnails is where I found it, my newest project, my turbobrick. It was an ad for a 1990 Volvo 740 Turbo, and the pictures (one shown above) showed it looking less than perfect, but broke free my hobby mechanic gears of boredom. The intense internet research that ensued after this ad would throw me deep into a rabbit hole that I knew I was not going to be able to climb out of. The immense amount of frustration that I would soon experience? Priceless. The car was for sale locally and was less than a 20-minute drive from the apartment that I share with my girlfriend who luckily for me is very supportive of this hobby. This is lucky for me because this car was soon to absorb her garage space (the only garage space) for the next 3 months. We arrived at the sellers house, identifying it by the white Volvo-shaped lawn ornament that adorned the front of his home. After looking at the car for a couple minutes we quickly determined that if this car was a diamond in the rough, there was a lot of "rough" we needed to dredge through to reach the diamond. It smoked, a lot. It knocked, a lot. It smelled, real bad. But alas it was relatively clean and most importantly nobody had, how should I say it? Messed with it. A couple hours and $500 later, with the birthday gift of negotiation and some financial contribution from my girlfriend, I owned myself a car. A car I knew absolutely nothing about, but damn was I excited. This is where I decided to start "BuyitBroken" a Youtube Vlog of sorts that will generally document my Volvo trials and tribulations or pretty much any automotive related work I may run into. This is the first video in a series that may be pushed to the back burner due to the final semester of my college schooling about to begin, but will hopefully not be forgotten.